The Honda Pilot is the car you buy when cramming your teenage kids into a CR-V just ain’t happening. What do you need to know before you buy a Honda Pilot? Don’t worry, we’ll tell you everything right here in our Buyer’s Guide. So you and your significant other decided to multiply. Now you’ve got a bunch of screaming brats crammed into your Honda CR-V and it’s getting a bit tight. Timmy just turned 13 and hit his growth spurt, so he’s really strugglin’ back there trying to squish between the baby seat on his right and his overweight little brother on the left. Something’s gotta change. Here to save the day is the Honda Pilot. It’s basically a CR-V that, like Timmy, hit its growth spurt. It’s much longer, wider, and roomier inside. It even comes with a third row so you can multiply even further! And, of course, the Pilot promises the legendary Honda reliability that brought you to the Honda showroom in the first place. The Honda Pilot is all new for 2016 and gets a new, 300 pound lighter platform based on the Acura MDX. Outside, the Honda’s styling is new and a bit odd. The top bar of the grille pierces into the headlights, and the taillights look a bit Audi-ish, but overall it’s not ugly. New for ‘16, the 3.5-liter V6 gets a bit more power and is mated to either a 6-speed auto or an all-new 9-speed automatic. 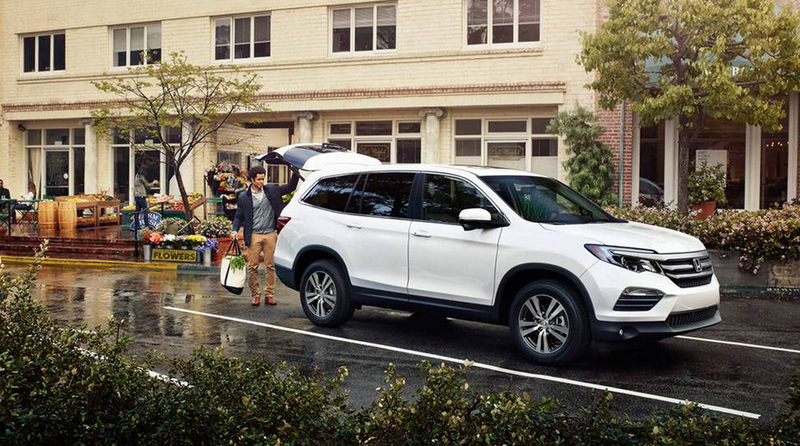 The Pilot’s new safety features like automatic emergency braking, adaptive cruise control, and lane brake assist help it receive a Top Safety Pick + award from the Insurance Institute for Highway Safety – a big deal considering how valuable safety is for mid-size CUV shoppers. If we were buying a Pilot, we’re gettin’ the base LX with all-wheel drive. It gets the same 280 horsepower 3.5-liter V6, the same MacPherson Strut front suspension, the same multi-link rear suspension, the same electric power steering, and the same 12.6 inch front vented discs as all the other trim levels. Sure, it doesn’t come with the 9-speed, but that only comes with the fancy Touring and Elite trims, anyhow — a bit pricey for our tastes. Plus, the 9-speed actually doesn’t improve the combined fuel economy ratings like you might suspect. Not to mention, the base LX comes decently well equipped. It has nice 18” alloy wheels, active noise canceling to keep the interior quiet, a multi-angle rearview camera, tons of airbags, Bluetooth, and of course, a third row for your leftover children. We’d throw in some $525 roof rails and $225 cross bars for our camping gear, and call it a day.